The Giants Won the Super Bowl! INDIANAPOLIS -- It is perhaps fitting, in a surreal, oh why not sort of way, that the game-winning touchdown in one of the pants-tighteningly tense Super Bowls of our lifetime featured a defense begging the opposing team to score and an offense desperately trying not to. Ahmad Bradshaw's six-yard touchdown "run" was accidental and insane and just perfect. It was sort of the athletic equivalent of putting opposite magnets next to each other. It looked like he had just been tased. And it will be the looniest, most beautiful highlight that Giants fans are going to watch for decades upon decades. The Giants have won the Super Bowl over the Patriots. Again. There will be so much to go over in the coming days/weeks/months/years, but the play we'll remember the most will be Eli Manning, finishing off his Super Bowl drive before anyone had a chance to realize it was happening. With less than four minutes left, Manning and the Giants began a drive down two, 17-15, all sorts of infinite history on the line. Mario Manningham will be remembered for having The Giants Catch II, a 38-yard bit of a perfection that changed everything, but as nice as the catch was, it was Manning who made it happen. Manningham was double covered, but Manning hit him perfect. Manning was brilliant all game, ending the night with 3o-for-40 passing for 296 yards and a touchdown ... and his second Super Bowl MVP award. Eli Manning, this guy, has played the biggest, best two games of his life at the two most important times. He's probably the best quarterback in Giants history, and a legend in this town forever. And he's only 31 years old. It was a crazy game, with Brady almost equally brilliant even though the Giants looked like the better team throughout. That the Patriots were up at halftime, frankly, was a bit of a disaster. The Giants dominated almost the entire half, particularly the first quarter, in which Manning completed his first nine passes, a Super Bowl record. Those nine passes covered 77 yards and went to six different receivers, one of which was a touchdown to Victor Cruz. (Giving everyone the Super Bowl salsa dance everyone had been waiting for.) But for all Manning's brilliance, the Giants were unable to finish several drives, including one where Tom Coughlin elected to punt on fourth-and-four at the Patriots' 40. Punter Steve Weatherford -- who was probably the MVP at halftime -- kept the Patriots pinned, including a drive that Brady began at his own two-yard line with 3:55 left. Brady was perfect on the drive, 10-for-10, finally hitting Danny Woodhead in the final seconds to give the Patriots the lead. (Brady was 15-18 for 147 yards and a TD at the half; even better than Manning, as it turned out.) The Patriots were able to capitalize because the Giants were unable to. The Giants did everything better than the Patriots in the first half, and still trailed. The Giants had plenty of opportunities in the second half as well, with two more drives ending in field goals rather than touchdowns. Meanwhile, Brady had a stretch where he completed 16 consecutive passes (a Super Bowl record itself) for 154 yards and 2 TDs ... all during a stretch in which Manning didn't even attempt a pass. The Giants even had luck on their side: They fumbled the ball three times and somehow recovered it every time ... and two Patriots penalties gave the ball back to the Giants when they would have punted. The Giants may have been victimized with an iffy non-pass interference call midway through the fourth quarter that surely cost them a chance to take the lead ... but they'd had so many other opportunities at that point that it's difficult to grow too angry about it. But then the defense pressured Brady at the right times, and gave Manning a chance to make that pass, which gave Bradshaw a chance to score that surreal, glorious touchdown. The whole thing was madness. The whole thing was beautiful. The Giants finished the regular season 9-7, and they were outscored by their opponents. They looked shockingly inept just a month and a half ago in a depressing home loss to the Redskins. They were forgotten and booed in their own stadium. They have not lost since. Eli Manning has won two Super Bowls, one more than his brother, and one less than Tom Brady. Tom Coughlin is the oldest coach ever to win a Super Bowl. 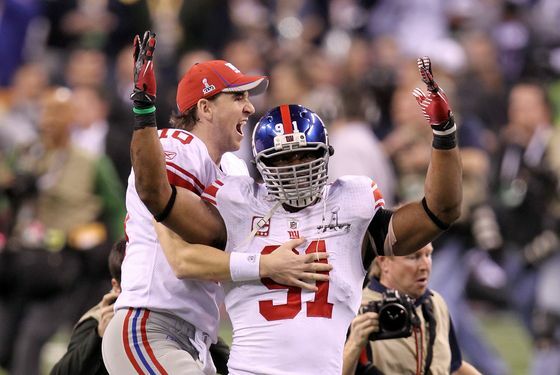 The Giants have won four Super Bowls, in four consecutive decades. It is surreal and insane and glorious and beautiful.